on Thursday, 05 July 2018. A lot can change in the blink of an eye, much less seven months. Back in November 2017, Michael Shirley told Trisha Murphy, who was the Director of Education and Workforce Development for the Rutherford County Chamber of Commerce, that he was interested in hiring a summer intern. He and wife Dr. Amy Shirley had not yet officially purchased a business, but he was “90 percent sure” they would be ready to host a rising high school senior by the first week of June when the four-week program started. 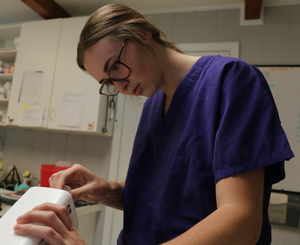 The local couple took ownership of Black Fox Veterinary Hospital two months ago, which, indeed, created an opportunity for Mia Kuhnle. The rising Oakland senior started her internship Monday afternoon. Black Fox Veterinary Hospital is just one business throughout Rutherford County participating in the third year of the program. “My expectation going in is to expand my knowledge,” Kuhnle said. Michael said he knew applying at Black Fox and interviewing with him was a risk for Kuhnle and the others because he and Amy did not even own the clinic at the time of Kuhnle’s interview. Kuhnle did not see it as risky. While Michael and Amy are establishing themselves as the new owners of Black Fox Veterinary Hospital, Roscoe Brown has provided heating, cooling, insulation, plumbing and geothermal needs in Rutherford County for more than 75 years. Ramsey will ride along with a service tech on maintenance calls and demand service calls. The job is expected to vary from day-to-day with some calls requiring Ramsey to climb up into hot attics or get underneath houses. Ramsey will be learning the values of a business, Crook said, which includes everything from time management to the extent to which Roscoe Brown goes to in making sure customers are taken care. “That’s something (Ramsey) can take into anything he does moving forward,” Crook said. Ramsey and his friends are in the process of opening their own online retail outlet for men’s fashion. While the two businesses are very different from one another, he has identified common characteristics and is hoping his internship will help him learn how to professionally conduct business with customers. “It’s a valuable program,” said Ramsey, when speaking of the summer internship program. Michael, who will join his wife full time at Black Fox after his contract with Rutherford County Schools is up at the end of June, structured Kuhnle’s four-week internship as if it were a syllabus for a career class. 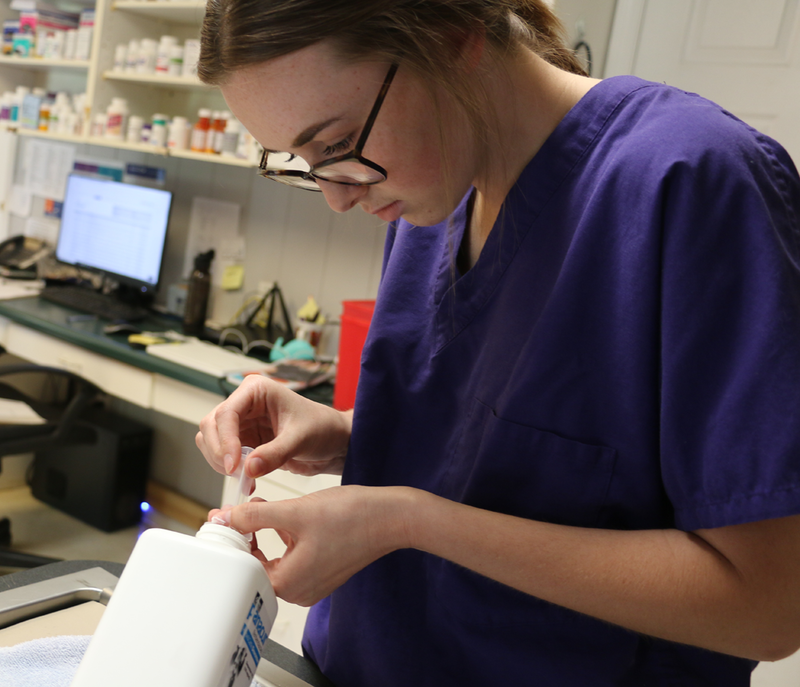 She will spend one week in each of the clinic’s four zones — front desk, kennels, in-patient and out-patient and then surgery — with each experience building on the past experiences. Kuhnle will have specific experiences to master each week. 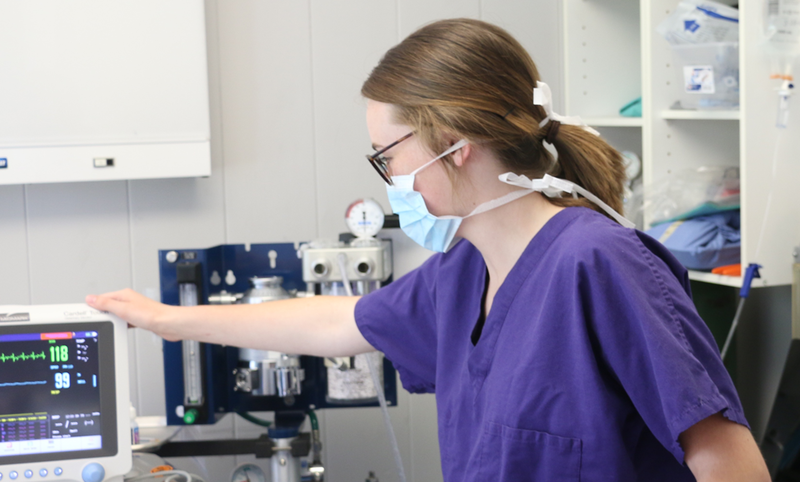 Mia Kuhnle is pictured on just the second day of her summer internship with Black Fox Veterinary Hospital. Owner Michael Shirley said he hopes the experience helps Kuhnle make an informed decision as to whether or not she pursues becoming a veterinarian in college. In the meantime, he added, "Somebody is going to get a good tech. It may be us."